"Pugin" redirects here. For the Joseon political faction, see Northerners (Korean political faction). For the surname, see Pugin (surname). 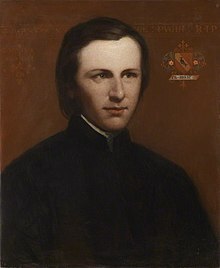 Augustus Welby Northmore Pugin (/ˈpjuːdʒɪn/ PEW-jin; 1 March 1812 – 14 September 1852) was an English architect, designer, artist, and critic who is principally remembered for his pioneering role in the Gothic Revival style of architecture. His work culminated in designing the interior of the Palace of Westminster in Westminster, London, England and its iconic clock tower, later renamed the Elizabeth Tower, which houses the bell known as Big Ben. Pugin designed many churches in England and some in Ireland and Australia. He was the son of Auguste Pugin, and the father of Edward Welby and Peter Paul Pugin, who continued his architectural firm as Pugin & Pugin. He also created Alton Castle in Alton, Staffordshire. Pugin was the son of the French draughtsman Auguste Pugin, who had emigrated to England as a result of the French Revolution and had married Catherine Welby of the Welby family of Denton, Lincolnshire, England. Augustus was born on 1 March 1812 at his parents' house in Bloomsbury, London, England. Between 1821 and 1838, Pugin's father had published a series of volumes of architectural drawings, the first two entitled Specimens of Gothic Architecture and the following three Examples of Gothic Architecture, that not only remained in print but were the standard references for Gothic architecture for at least the next century. As a child, his mother took Pugin each Sunday to the services of the fashionable Scottish Presbyterian preacher Edward Irving (later the founder of the Holy Catholic Apostolic Church), at his chapel in Cross Street, Hatton Garden, Camden, London, England. Pugin quickly rebelled against this version of Christianity: according to Benjamin Ferrey, Pugin "always expressed unmitigated disgust at the cold and sterile forms of the Scottish church; and the moment he broke free from the trammels imposed on him by his mother, he rushed into the arms of a church which, pompous by its ceremonies, was attractive to his imaginative mind". Pugin learned drawing from his father, and for a while attended Christ's Hospital. After leaving school he worked in his father's office, and in 1825 and 1827 accompanied him on visits to France. His first commissions independent of his father were for designs for the goldsmiths Rundell and Bridge, and for designs for furniture of Windsor Castle, England from the upholsterers Morrel and Seddon. Through a contact made while working at Windsor, he became interested in the design of theatrical scenery, and in 1831 obtained a commission to design the sets for the production of the new opera Kenilworth at the Royal Opera House, Covent Garden. He also developed an interest in sailing, and briefly commanded a small merchant schooner trading between Great Britain and Holland, which allowed him to import examples of furniture and carving from Flanders, with which he later furnished his house at Ramsgate in Kent, England. During one voyage in 1830 he was wrecked on the Scottish coast near Leith, as a result of which he came into contact with Edinburgh architect James Gillespie Graham, who advised him to abandon seafaring for architecture. He then established a business supplying historically accurate, carved wood and stone detailing for the increasing number of buildings being constructed in the Gothic Revival style, but the enterprise quickly failed. In 1831, at the age of 19, Pugin married the first of his three wives, Anne Garnet. Anne died a few months later in childbirth, leaving him a daughter. He had a further six children, including the architect Edward Welby Pugin, with his second wife, Louisa Button, who died in 1844. His third wife, Jane Knill, kept a journal of their marital life, from their marriage in 1848 to Pugin's death, which was later published. Their son was the architect Peter Paul Pugin. Following his second marriage in 1833, Pugin moved to Salisbury, Wiltshire, England with his wife, and in 1835 bought half an acre of land in Alderbury, circa one and a half miles outside the town. On this he built a Gothic Revival style house for his family, which he named St. Marie's Grange. Of it, Charles Locke Eastlake said "he had not yet learned the art of combining a picturesque exterior with the ordinary comforts of an English home". In 1834, Pugin converted to the Roman Catholic Church and was received into it the following year. Pugin's father, Auguste-Charles Pugin was a Frenchman who had immigrated to England as a result of the French Revolution, and probably, like many others, converted to the Anglican Church in order to obtain employment, because it was very improbable that any non-Anglican would obtain a governmental commission or tender, for example. British society at the time had many restrictions on any person not adhering to the state religion of the Church of England: Non-Anglicans could not attend a university, for example, or serve on parish or city councils, be a member of Parliament, serve in the armed forces, or even serve on a jury. A number of reforms in the early 19th century relieved these restrictions, the most important of which was the Roman Catholic Relief Act of 1829, which specifically abolished the restrictions. After 1829 it became, at least theoretically, possible for Roman Catholics to have a successful career; this was the context of A. W. Pugin's conversion to the Roman Catholic Church. However, his conversion also acquainted him with new patrons and employers. In 1832 he made the acquaintance of John Talbot, 16th Earl of Shrewsbury, a Roman Catholic sympathetic to his aesthetic theory and who employed him in alterations and additions to his residence of Alton Towers, which subsequently led to many more commissions. 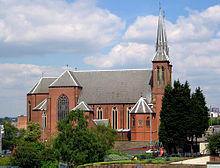 Shrewsbury commissioned him to build St. Giles Roman Catholic Church, Cheadle, Staffordshire, England, which was completed in 1846, and Pugin was also responsible for designing the oldest Catholic Church in Shropshire, England, St Peter and Paul Church, Newport. In 1836, Pugin published Contrasts, a polemical book which argued for the revival of the medieval Gothic style, and also "a return to the faith and the social structures of the Middle Ages". Each plate in the book selected a type of urban building and contrasted the 1830 example with its 15th-century equivalent. In one example, Pugin contrasted a medieval monastic foundation, where monks fed and clothed the needy, grew food in the gardens – and gave the dead a decent burial – with "a panopticon workhouse where the poor were beaten, half starved and sent off after death for dissection. Each structure was the built expression of a particular view of humanity: Christianity versus Utilitarianism." Pugin's biographer, Rosemary Hill, wrote: "The drawings were all calculatedly unfair. King's College London was shown from an unflatteringly skewed angle, while Christ Church, Oxford, was edited to avoid showing its famous Tom Tower because that was by Christopher Wren and so not medieval. But the cumulative rhetorical force was tremendous." In 1841 he published his illustrated The True Principles of Pointed or Christian Architecture, which was premised on his two fundamental principles of Christian architecture. He conceived of "Christian architecture" as synonymous with medieval, "Gothic", or "pointed", architecture. In the work he also wrote that contemporary craftsmen seeking to emulate the style of medieval workmanship should reproduce its methods. In 1841 he left Salisbury, having found it an inconvenient base for his growing architectural practice. He sold St. Marie's Grange at a considerable financial loss, and moved temporarily to Cheyne Walk, Chelsea, London, England. He had, however, already purchased a parcel of land at West Cliff, Ramsgate, Thanet, Kent, England, where he proceeded to build for himself a large house and, at his own expense, a church dedicated to St. Augustine, after whom he thought himself named. He worked on this church whenever funds permitted it. His second wife died in 1844 and was buried at St Chad's Cathedral, Birmingham, England, which he had designed. 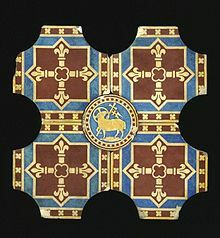 Following the destruction by fire of the Palace of Westminster in Westminster, London in 1834, Pugin was employed by Sir Charles Barry to supply interior designs for his entry to the architectural competition which would determine who would build the new Palace of Westminster. Pugin also supplied drawings for the entry of James Gillespie Graham. This followed a period of employment when Pugin had worked with Barry on the interior design of King Edward's School, Birmingham. Despite his conversion to the Roman Catholic Church in 1834, Pugin designed and refurbished both Anglican and Catholic churches throughout England. Other works include St. Chad's Cathedral, Erdington Abbey, and Oscott College, all in Birmingham, England. He also designed the collegiate buildings of St. Patrick and St. Mary in St. Patrick's College, Maynooth, Ireland; though not the collegiate chapel. His original plans included both a chapel and an aula maxima (great hall), neither of which were built because of financial constraints. 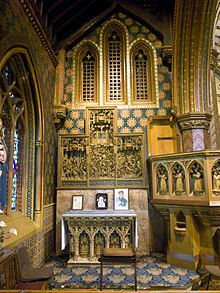 The college chapel was designed by a follower of Pugin, the Irish architect J. J. McCarthy. Also in Ireland, Pugin designed St. Mary's Cathedral in Killarney, St. Aidan's Cathedral in Enniscorthy (renovated in 1996), and the Dominican Church of the Holy Cross in Tralee. He revised the plans for St. Michael Church in Ballinasloe, Galway, Ireland. Bishop Wareing also invited Pugin to design what eventually became Northampton Cathedral, a project that was completed in 1864 by Pugin's son Edward Welby Pugin. Pugin visited Italy in 1847; his experience there confirmed his dislike of Renaissance and Baroque architecture, but he found much to admire in the medieval art of northern Italy. In February 1852, while travelling with his son Edward by train, Pugin suffered a total breakdown and arrived in London unable to recognise anyone or speak coherently. For four months he was confined to a private asylum, Kensington House. In June, he was transferred to the Royal Bethlem Hospital, popularly known as Bedlam. At that time, Bethlem Hospital was opposite St George's Cathedral, Southwark, one of Pugin's major buildings, where he had married his third wife, Jane, in 1848. Jane and a doctor removed Pugin from Bedlam and took him to a private house in Hammersmith where they attempted therapy, and he recovered sufficiently to recognise his wife. In September, Jane took her husband back to The Grange in Ramsgate, where he died on 14 September 1852. He is buried in his church next to The Grange, St Augustine's, Ramsgate. On Pugin's death certificate, the cause listed was "convulsions followed by coma". Pugin's biographer, Rosemary Hill, suggests that, in the last year of his life, he was suffering from hyperthyroidism which would account for his symptoms of exaggerated appetite, perspiration, and restlessness. Hill writes that Pugin's medical history, including eye problems and recurrent illness from his early twenties, suggests that he contracted syphilis in his late teens, and this may have been the cause of his death at the age of 40. In 1836, having won the architectural competition to design the new Palace of Westminster, Sir Charles Barry asked Pugin to supply detailed designs for the interior of the new building, including stained glass, metalwork, wood carving, upholstery, furniture and a royal throne. Pugin's biographer, Rosemary Hill, shows that Barry designed the Palace as a whole, and only he could co-ordinate such a large project and deal with its difficult paymasters, but he relied entirely on Pugin for its Gothic interiors, wallpapers and furnishings. At the end of Pugin's life, in February 1852, Barry visited him in Ramsgate and Pugin supplied a detailed design for the iconic Palace clock tower, in 2012 dubbed the Elizabeth Tower but popularly known as Big Ben. The design is very close to earlier designs by Pugin, including an unbuilt scheme for Scarisbrick Hall, Lancashire. The tower was Pugin's last design before descending into madness. In her biography, Hill quotes Pugin as writing of what is probably his best known building: "I never worked so hard in my life [as] for Mr Barry for tomorrow I render all the designs for finishing his bell tower & it is beautiful & I am the whole machinery of the clock." Hill writes that Barry omitted to give any credit to Pugin for his huge contribution to the design of the new Houses of Parliament. 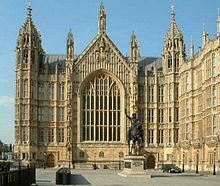 In 1867, after the deaths of both Pugin and Barry, Pugin's son Edward published a pamphlet, Who Was the Art Architect of the Houses of Parliament, a statement of facts, in which he asserted that his father was the "true" architect of the building, and not Barry. Pugin was invited to Ireland by the Redmond family, initially to work in County Wexford. He arrived in Ireland in 1838 at a time of greater religious tolerance, when Catholic churches were permitted to be built. Most of his work in Ireland consisted of religious buildings. Pugin demanded the highest quality of workmanship from his craftsmen, particularly the stonemasons. His subsequent visits to the country were brief and infrequent. He was the main architect of St Aidan's Roman Catholic Cathedral for the diocese of Ferns in Enniscorthy, County Wexford. Pugin was the architect of the Russell Library at St. Patrick's College, Maynoooth, although he did not live to see its completion. St Francis Xavier's Church, Berrima, New South Wales, designed by Augustus Pugin. The first Catholic Bishop of New South Wales, Australia, John Bede Polding, met Pugin and was present when St Chad's Cathedral, Birmingham and St Giles' Catholic Church, Cheadle were officially opened. Polding persuaded Pugin to design a series of churches for him. Although a number of churches do not survive, St Francis Xavier's in Berrima, New South Wales is regarded as a fine example of a Pugin church. Pugin's notion was that Gothic was Christian and Christian was Gothic ... It became the way people built churches and perceived churches should be. Even today if you ask someone what a church should look like, they'll describe a Gothic building with pointed windows and arches. Right across Australia, from outback towns with tiny churches made out of corrugated iron with a little pointed door and pointed windows, to our very greatest cathedrals, you have buildings which are directly related to Pugin's ideas. After his death Pugin's two sons, E. W. Pugin and Peter Paul Pugin, continued operating their father's architectural firm under the name Pugin & Pugin. This work includes most of the "Pugin" buildings in Australia and New Zealand. Eastlake, writing in 1872, noted that the quality of construction in Pugin's buildings was often poor, and believed he was lacking in technical knowledge, his strength lying more in his facility as a designer of architectural detail. Pugin's legacy began to fade immediately after his death. This was partly due to the hostility of John Ruskin. In his appendix to The Stones of Venice (1851), Ruskin wrote of Pugin, "he is not a great architect but one of the smallest possible or conceivable architects". Contemporaries and admirers of Pugin, including Sir Henry Cole, protested at the viciousness of the attack and pointed out that Ruskin's idea on style had much in common with Pugin's. After Pugin's death, Ruskin "outlived and out-talked him by half a century". Sir Kenneth Clark wrote, "If Ruskin had never lived, Pugin would never have been forgotten." Nonetheless, Pugin's architectural ideas were carried forward by two young architects who admired him and had attended his funeral, W. E. Nesfield and Norman Shaw. George Gilbert Scott, William Butterfield and George Edmund Street were influenced by Pugin's designs, and continued to work out the implication of ideas he had sketched in his writings. In Street's office, Philip Webb met William Morris and they went on to become leading members of the English Arts and Crafts Movement. When the German critic Hermann Muthesius published his admiring and influential study of English domestic architecture, Das Englische Haus (1904), Pugin was all but invisible, yet "it was he ... who invented the English House that Muthesius so admired". An armoire that he designed (crafted by frequent collaborator John Gregory Crace) is held at the Victoria and Albert Museum. It was shown at the Great Exhibition of 1851, but was not eligible for a medal, as it was shown under Crace's name and he was a judge for the Furniture Class at the exhibition. On 23 February 2012 the Royal Mail released a first class stamp featuring Pugin as part of its "Britons of Distinction" series. The stamp image depicts an interior view of the Palace of Westminster. Also in 2012, the BBC broadcast God's Own Architect, an arts documentary program on his achievements hosted by Richard Taylor. Slightly less grand than the above are the railway cottages at Windermere railway station in Cumbria which have been loosely attributed to Pugin or a follower. Believed to date from 1849, and probably some of the first houses to be built in Windermere, the terrace of cottages was built for railway executives. One of the fireplaces is a copy of one of his in the Palace of Westminster. Church of Assumption of Mary, Bree, County Wexford. 1837–1839. Patronage from the Redmond family. St. Peter's College, Summerhill Road, Wexford, County Wexford. Chapel.1838–1841. 6 bay chapel integrated as part of the College. Built in Wexford red sandstone. Various Pugin elements including stations of cross, balcony, rood screen etc. were removed in renovation of 1950. Church of St. James's, Ramsgrange, County Wexford. 1838–1843. Chapel at Loreto Abbey, Rathfarnham, Dublin. Currently vacant and out of use. Church of St. Michael the Archangel, Gorey, County Wexford. 1839–1842. Cruciform plan in Romanesque style. 9 bay nave. Low square tower over the crossing. The design may have been influenced by Dunbrody Abbey, County Wexford. Built in Ballyscartin limestone with Wicklow granite dressings. Spire not constructed. Patronage of Sir. Thomas Esmonde and family. Loreto Convent, St. Michael's Road, Gorey, County Wexford. 1842–1844. St. Mary's Cathedral, Killarney, County Kerry. 1842–1856. Cruciform early English style in limestone. Much modified. 12 bay nave and spire over the crossing completed by others. Two Villas, Cobh, County Cork. 1842 for 5th. Viscount Midleton. Church of St. Mary's, Tagoat, County Wexford. 1843–1848. Cruciform plan. 5 bay nave and aisles. Contains Pugin brasses, tiles etc. Damaged in fire 1936. St. Aidan's Cathedral, Enniscorthy, County Wexford. 1843–1860. Cruciform plan. Church of St. Alphonsus or Blessed Virgin Mary, Barntown, County Wexford. 1844–1848. 7 bay church with nave and aisles. Scissors roof truss. Design may be based on an early church at Stanton, Cambridgeshire. Interior much modified. Houses, Midleton, County Cork. For Viscount Midleton. 1845. St. Patrick's College, Maynooth, County Kildare. 1845–1850. Quadrangles. Presentation Convent, Waterford, County Waterford. Quadrangle and internal cloister. Presentation Monastery, Port Road, Killarney, County Kerry. 1846–1862. Adare Manor, Adare, County Limerick. 1846. Alterations including hall ceiling, staircase, gallery etc. St. John's Convent of Mercy, Birr, County Offaly. 1846–1856. Completed by E.W. Pugin. ^ Hill, 2007, List of Works, pp. 501–528. ^ Hill, 2007, p. 495. ^ Ferrey, 1861, pp. 43–4. ^ Ferrey, 1861, p. 45. ^ Eastlake, 1872, p. 146. ^ Eastlake, 1872, p. 147. ^ a b Eastlake, 1872, p. 148. ^ Porter, Bertha (1890). "Graham, James Gillespie" . In Stephen, Leslie; Lee, Sidney (eds.). Dictionary of National Biography. 22. London: Smith, Elder & Co.
^ Eastlake, 1872, pp. 147–8. 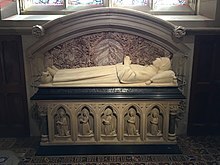 ^ "Augustus Northmore Welby Pugin". Dictionary of Art Historians. ^ Jane Pugin and Caroline Stanford, "Dearest Augustus and I": The Journal of Jane Pugin. Spire Books, 2004. ^ Ferrey, 1861, p. 93. ^ Ferrey, 1861, pp. 73–4. ^ Eastlake 1872, pp. 148–9. ^ "CATHOLIC ENCYCLOPEDIA: Augustus Welby Northmore Pugin". www.newadvent.org. Retrieved 29 March 2018. ^ Clifton Diocese: "Parliament's Pugin Plaque in Salisbury". ^ a b Eastlake, 1872, p. 150. ^ a b c Hill, Rosemary (24 February 2012). "Pugin, God's architect". The Guardian. Guardian Media Group. Retrieved 19 March 2012. ^ a b Eastlake, 1872, pp. 150–1. ^ Ferrey, 1861, p. 94. ^ Eastlake, 1872, p. 96. ^ Hill, 2007, pp. 141–6. ^ "puginfoundation.org". Go Daddy. Archived from the original on 24 January 2018. Retrieved 29 March 2018. ^ Meacham, Steve (4 February 2003). "A genius in his Gothic splendour". Sydney Morning Herald. Fairfax Media. Archived from the original on 22 December 2005. Retrieved 30 January 2006. ^ a b "Armoire | A. W. Pugin | V&A Search the Collections". collections.vam.ac.uk. Retrieved 6 February 2017. ^ "Royal Mail Britons of Distinction Stamp Issue". GBStamp.co.uk. 1 June 2011. Retrieved 20 March 2012. ^ "Pugin: God's Own Architect". BBC Four. Retrieved 19 January 2019. ^ "Pugin Society website". Archived from the original on 4 March 2010. Retrieved 13 November 2007. ^ Beattie, Gordon J (1997). Gregory's Angels. Gracewing Publishing. p. 143. ^ "Cathedral tour – 9". Leeds Cathedral. Archived from the original on 31 January 2009. Retrieved 31 January 2009. ^ "Restoring a masterpiece". BBC Leeds. Archived from the original on 14 February 2009. Retrieved 31 January 2009. ^ Pevsner, Nikolaus (1968). Bedfordshire and the County of Huntingdon and Peterborough. The Buildings of England. Harmondsworth: Penguin Books. p. 338. ISBN 0-14-0710-34-5. ^ Pevsner, Nikolaus; Cherry, Bridget (revision) (1973) . Northamptonshire. The Buildings of England (2nd ed.). Harmondsworth: Penguin Books. p. 338. ISBN 0-14-071022-1. ^ Historic England. "The Terrace (Grade II) (1203378)". National Heritage List for England. Retrieved 27 September 2015. ^ "A W N Pugin in Cumbria". Visit Cumbria. Brian Andrews, 2001, Creating a Gothic Paradise: Pugin at the Antipodes, Hobart, Tasmanian Museum and Art Gallery. Exhibition catalogue. Charles Locke Eastlake, A History of the Gothic Revival, London, Longmans, Green & Co, 1872. Benjamin Ferrey, 1861, Recollections of A.N. Welby.Pugin, and his Father Augustus Pugin, London, Edward Stanford. Michael Fisher, Alexandra Wedgwood, 2002, Pugin-Land: A W N Pugin, Lord Shrewsbury and the Gothic Revival in Staffordshire, Stafford Fisher. Rachel Hasted, 1995, Scarisbrick Hall – A Guide, Social History at Lancashire County Museum Service, 1984. Rosemary Hill, Augustus Welby Northmore Pugin: A Biographical Sketch, in A.W.N. Pugin: Master of Gothic Revival, New Haven and London, Yale University Press. Pugin, AWN (1836). Contrasts: Or, A Parallel Between the Noble Edifices of the Fourteenth and Fifteenth Centuries and Similar Buildings of the Present Day. Shewing the Present Decay of Taste. Accompanied by Appropriate Text. London: Charles Dolman. 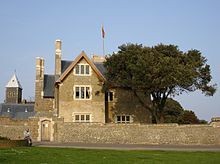 Wikimedia Commons has media related to Augustus Welby Northmore Pugin. Wikisource has the text of the 1885–1900 Dictionary of National Biography's article about Pugin, Augustus Welby Northmore. Wikisource has the text of the 1911 Encyclopædia Britannica article Pugin, Augustus Welby Northmore. "Pugin's manifesto": an essay on Pugin's early work from TLS, 1 August 2007. "Archival material relating to Augustus Pugin". UK National Archives.